Saint Francis International School is fully accredited by the Southern Association of Colleges and Schools' AdvancED programand registered with the Maryland State Department of Education. Saint Francis International School follows the curriculum standards and policies of the Archdiocese of Washington. We particularly emphasize integrating those standards to focus on the whole-child (mind, body, and spirit). Our application of the curricula is sensitive to the needs of a culturally and linguistically diverse student population. We work to provide a learning environment that challenges students to grow to their fullest potential utilizing their unique skills and talents. 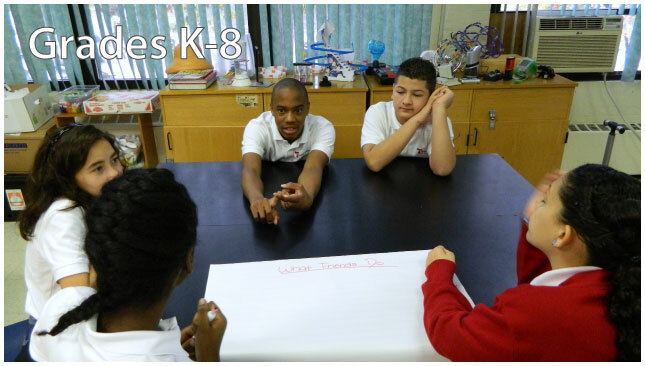 We assess our students’ success using a broad range of formative and summative assessments. Our progress in reading and mathematics fundamentals are also measured by administration of the Scantron Performance Series assessment in grades 2-8 and the PALS assessment in Pre-K 4 thru grade 1. These assessments are given two to three times each year to provide for measurement of growth and diagnostic/prescriptive implmentation of our standards and curriculum. Students in grades 3-8 annually participate in the Archdiocese of Washgington Faith Knowledge Assessment and all students in grade 8 take the High School Placement Test. Our school day is 8:00 am - 3:30 pm. Extended care is available before school from 6:45 am - 8:00 am and after school from 3:30 pm - 6:30 pm. Our school year runs from late August/early September through June. Our school year is 180 days. Refer to our school calendar for more information about our school year. The heart of our school is our well trained group of teachers. Their service to our children is born out their faith and their desire to see each child grow to his or her fullest potential. Our teachers are committed to continual professional growth as they strive to provide our students with the highest level of instruction. We believe in educating each as a whole person, this means we believe that our entire curriculum must work towards forming men and women who are capable of using all of the gifts God has given them. We believe that it is our responsibility to help parents teach their children both skills and knowledge so that each child might grow in wisdom and be prepared to a productive citizen of the world. Saint Francis International School is committed to using the best resources to facilitate our students' learning. We seek to use a broad variety of textbooks, computer programs and hardware, science equipment, library materials, and other resources so that our students can maximize their learning potential. Because each child is unique, each child has unique needs. Saint Francis International School recognizes the value in providing services that will allow students to thrive in the classroom. We provide a broad variety of support services for our students and families including an academic resource support program, English language learning (ELL) support specialist, a school counselor, a school nurse, a student assistance team, and remedial support in math and English. At Saint Francis International School we require a school uniform for all of our students in grades K-8 (the uniform is optional for preschool). We choose to ask students to wear a uniform for several important reasons (You can read why we require uniforms by clicking the "details" link below). Uniforms are sold exclusively by Risse Brothers in College Park.